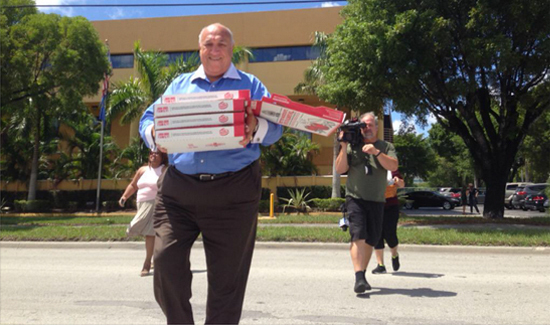 When a group of angry citizens got together to protest recent comments made by John Rivera, the president of the Dade County PBA, he went out and bought them all pizza. It was an unusual move by a police union leader, and although we don’t know for sure what the impact was, it seems to us that personally handing out free food to people who are angry at you has to help calm things down. The protest was sparked by comments Rivera made claiming that Mayor Carlos Gimenez’s body-camera plan for police is aimed at attracting black voters in his bid for re-election. Rivera said he’s not opposed to the cameras but believes the money should be used to fill vacant positions in the force. About 40 people assembled outside the Police Benevolent Association’s offices demanding an apology from Rivera. Miami-Dade County commissioners this month approved the Mayor’s plan to spend $5 million over the next five years to equip county police with miniature surveillance cameras. Officers activate the cameras during interactions with citizens, with the hope that allegations of misconduct could be quickly confirmed or refuted by video footage. Civil rights groups, political leaders, and the White House have called for wider use of police body cameras.